St. Patrick’s day is coming soon! Do you need a simple craft to do with your kids, or do you need a cute decoration for a classroom or party. Here ya go! I have to say that we did two versions of a paper clover. Today, I am presenting the more simple version. The more involved and yet really visually interesting one will be up another day. If you are a visual person, the above tutorial will help. If not, I’ll break it down for you a bit. The idea was inspired by the respect heart garland we made over a year ago. You can take four of these paper hearts and turn them into a four leaf clover. You will want to cut your paper into 1″ x 11″ (length of a standard paper) strips. I used stock paper, but I think you could use construction paper too. You will need 5 strips per clover. Fold the strip in half and crease well. Then, bend the two ends of the heart around and staple those ends together. Once you have made all four hearts, you will want to staple them all together into the shape of a four leaf clover. 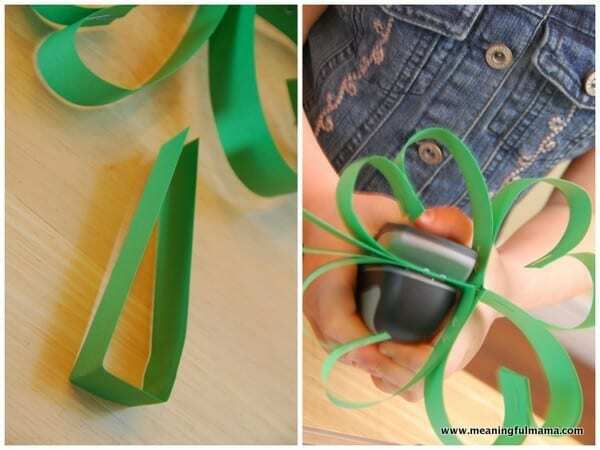 Leave two of the leaves not stapled so you can put the stem between them. The final step is to make the stem. You will want to fold it as shown above. Then, trim the stem to your desired height and staple it in between two of the leaves. There you have it. 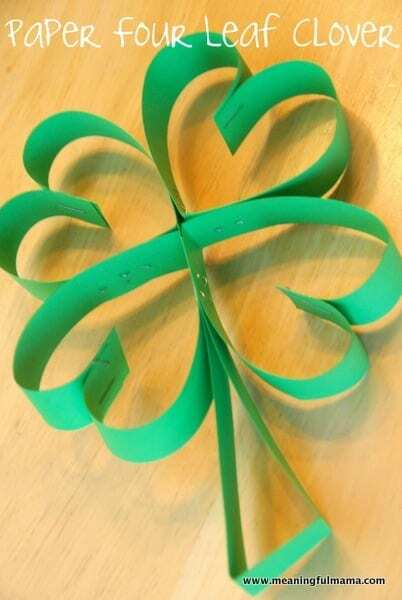 A simple, fun St. Patrick’s Day craft. 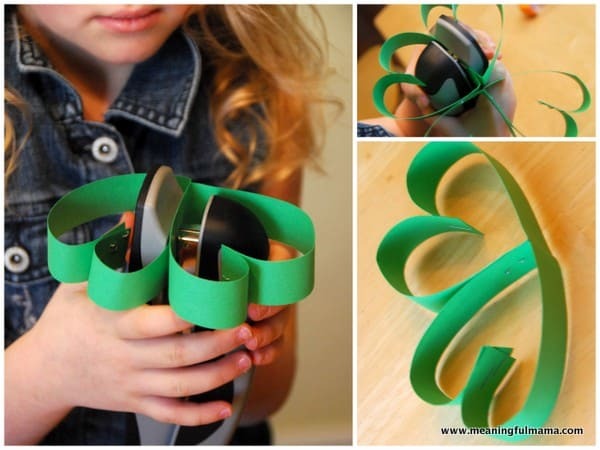 I think this would be something quick, easy, and cute to do in my classroom for St. Patrick’s day. 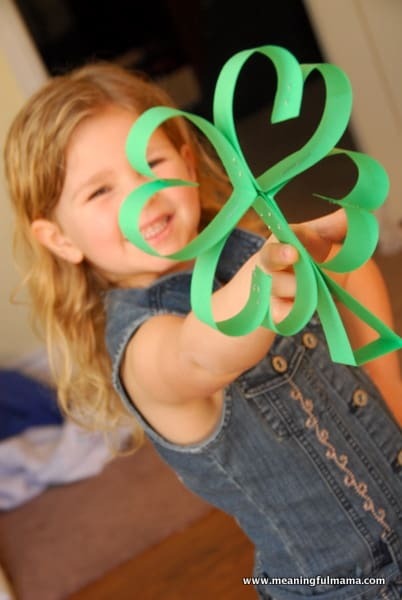 Very cute – I see shamrocks in my kids’ future! I tried this with construction paper, since cheaper but hearts don’t keep shape so doesn’t work well. It works perfect with green card stock though. I also used glue dots instead of stapler because I’ll be doing with a class of 18 and don’t have that many staplers. Glue dots work great! Thank you for the cute, easy, quick, craft! Thanks so much for letting me know! Good to get reports back on the materials that work well. I’m glad you had fun with it!! I’m glad you enjoyed making these. It’s fun to see your family doing it. Thanks for linking back to me as the resource!